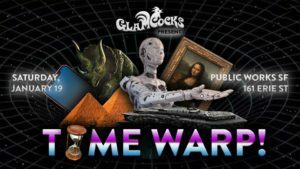 Public Works: GlamCocks present: Time Warp! The GlamCocks are filled with excitement for 2019! Life sends us hurtling ever into the future, and we go with one eye always looking backwards at the triumphs and tragedies of the past. So we’ve decided that the time has come for a celebration of the infinite possibilities that exist on the space-time continuum. We invite you to travel with us to anywhere and anywhen as the GlamCocks Present: Time Warp! Past and future are colliding on the dance floor, and you should embrace the era that speaks to your heart. Do you see yourself as an Elizabethan courtier? A flapper of the Roaring 20’s? A post-human of the Singularity yet to come? The Time Warp is bringing every moment together under one roof for the night. Live your past life fantasies, imagine the couture of tomorrow, or blur the lines as only a time-traveler can! Our favorite part of throwing dance parties is connecting with our amazing guests. We feel so lucky to be a part of such a creative and affirming community. Our parties are a fun opportunity for you to express your own unique style and dance your heart out. All we ask is that you help us continue to make our events the safe and welcoming space that they have come to be. Talk to strangers, and dance with anyone no matter their appearance or what era they’re from! When everyone feels accepted and empowered, we create a truly bright future together. From the Stone Age to the Space Age, this party is one for the history books! So saddle up your dinosaur or gas up your DeLorean and join us as the GlamCocks Present: Time Warp!